Wilderness is a wonderful thing. The American illustrator and writer Rockwell Kent understood how wilderness tugs at the soul: "I crave snow-topped mountains, dreary wastes, and the cruel Northern sea with its hard horizons," he wrote. Yes, we know that feeling. So do you. In his autobiography, published in 1955, Rockwell Kent dwelt on the pull of the North: "If minds can become magnetized, mine was: its compass pointed north." 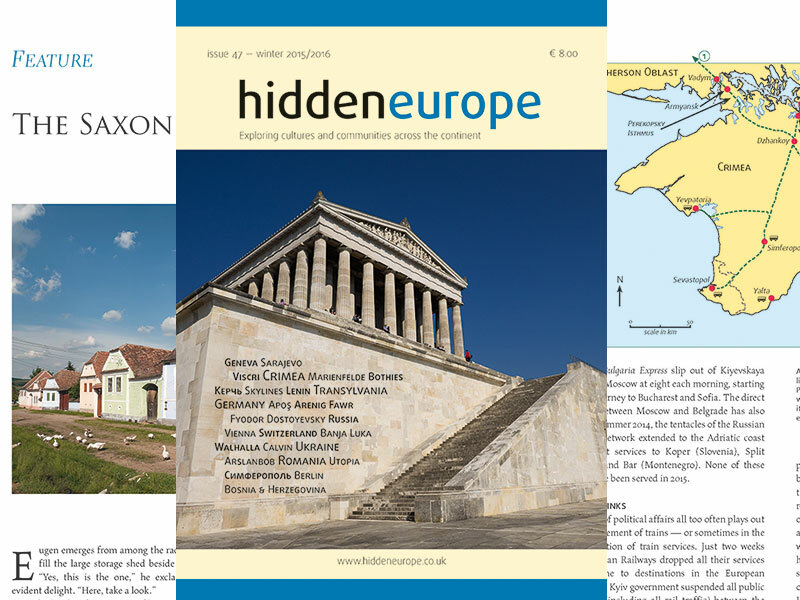 We head north in the latest issue of hidden europe magazine which is published next week (and is already available for purchase). Writer Philip Dunshea invites us to join him as he ventures onto Rannoch Moor. This vast wilderness can be a desperate place, in Phil's words "a ragged purgatory." And the crew of the Tegetthof surely thought much the same when their ship, stuck fast in pack ice, drifted close to Franz Josef Land in 1873. Wilderness is a wonderful thing. The American illustrator and writer Rockwell Kent understood how wilderness tugs at the soul: "I crave snow-topped mountains, dreary wastes, and the cruel Northern sea with its hard horizons," he wrote. Yes, we know that feeling. So do you. In his autobiography, published in 1955, Rockwell Kent dwelt on the pull of the North: "If minds can become magnetized, mine was: its compass pointed north." We head north in the latest issue of hidden europe magazine which is published next week (and is already available for purchase). Writer Philip Dunshea invites us to join him as he ventures onto Rannoch Moor. This vast wilderness can be a desperate place, in Phil's words "a ragged purgatory." And the crew of the Tegetthof surely thought much the same when their ship, stuck fast in pack ice, drifted close to Franz Josef Land in 1873. There are many dimensions of wilderness in hidden europe 39. Rannoch (in the Scottish Highlands) and Franz Josef Land (in the Russian Arctic) are just two of them. Wilderness breeds a particular humility. Rockwell Kent understood that, when he wrote of the prayerful reverence that wilderness invites. There is a soft litany of Parisian prayer in the pages of hidden europe 39. Duncan JD Smith escorts us through a tapestry of many faiths that colours the French capital. Duncan is an urban explorer, a man more inclined to cities than to wilderness. He has written regularly for hidden europe, and we publish his Paris essay to coincide with the publication later this month of Duncan's new book. That book is called Only in Paris - it promises to be a wonderful urban expedition through Paris' hidden corners and oddball sights. Our third guest writer in hidden europe 39 is Diego Vivanco. In his article on the village of Bielsa in the Pyrenees, Diego highlights the seasonal mayhem that attends the village's Shrovetide carnival. Lent must be truly penitential in a community that sanctions such pre-Lent transgression. Popes (and ex-popes) have been in the news of late, and we pick up the papal theme in hidden europe 39 as we travel through southern Poland to the Tatra Mountains - it was a journey made many times by the late Polish pontiff John Paul II who was born in the Skawa Valley. And we report on an unusual international footpath, the Passetto di Borgo which links the papal apartments in the Vatican with the Castel Sant'Angelo in Rome. It was a route of last resort for popes needing to flee the Vatican. And now it looks set to open to the public. Now that'll be a fine urban ramble. Of course you'll join us on a train or two in hidden europe 39. We ride the slow train to Zakopane and the fast train to Vienna, both places where the Habsburgs left their mark. We discover why trains are being shunted into sidings in the northern Balkans and join Zuleika Dobson as she pores over a train timetable in Oxford. All good stuff, but we return again and again to the wilder edges of Europe. The German island of Hooge features in the magazine. When we visited Hooge in mid-winter, it was a wild and windy spot. It made us think of Rockwell Kent who wrote of the misery and discomfort of being out in the cold and wild. "I love this misery," he wrote. And so do we. If you have read our Letter from Europe for months or even years, and never once read a copy of hidden europe magazine, now is the season to atone and make amends. A modest investment of just 7 euros will bring a touch of wilderness to your front door.